Recently, my older son came downstairs wearing the long face of a middle-schooler with Saturday homework. “I have stuff to do for school,” he said, “but I don’t know where to start.” I wished I could tell him to forget about it, to kick back and enjoy being a kid because (in my eyes) his childhood is passing at a rate that would alarm even Stephen Hawking. Instead, I suggested that he eat a small piece of chocolate (because chocolate makes everything better, even homework) and prioritize his workload. Upon further reflection, I realized that I should heed my own advice, for I am sorely in need of my own prioritization. I often feel that I am looking through a kaleidoscope at the jumbled-up collection of all the things I want and/or need to be doing. I know that some of those bright little bits are really worth pursuing, especially where my writing is concerned, but it can be hard to separate them from the rest of the sparkly mess. So I turned to Google, searched “tools for prioritization,” and ended up at this article at MindTools. From the article: “Prioritization…is a skill that you need to create calmness and space in your life so that you can focus your energy and attention on the things that really matter. It is particularly important when time is limited and demands are seemingly unlimited.” If this does not apply to you, please toast your good fortune with a Mai Tai as you relax on your private beach. The article goes on to offer a collection of Prioritization Tools, including Paired Comparison Analysis, Grid Analysis, The Action Priority Matrix, The Urgent/Important Matrix, The Ansoff Matrix and the Boston Matrices, Pareto Analysis, and Nominal Group Technique. I’m sure all these methods are great, but even trying to figure out which matrix would best suit me gave me an ache in my very non-analytical head. Just give me the one with Keanu Reeves, and we’ll call it good. 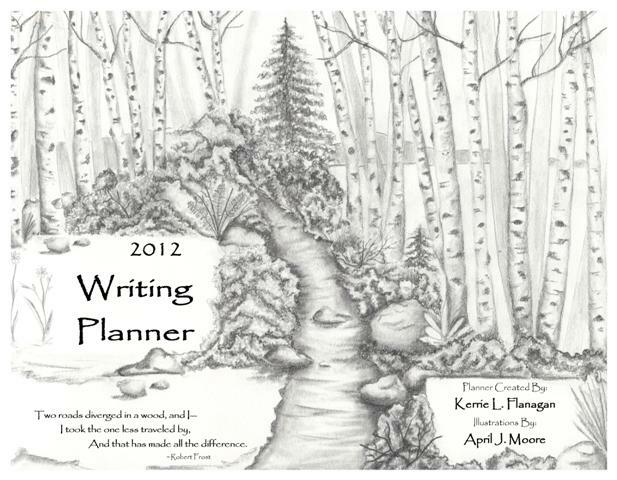 Instead, my chosen tool for prioritization in the coming year is the 2012 Writing Planner, created by Kerrie Flanagan and illustrated by April J. Moore. More than a calendar, the book is a “tool that provides you an opportunity to set goals, organize your schedule and your writing, and keep writing a main focus in your life.” I need help with all of those things, and I’m looking forward to using the planner to keep me on track. And thank goodness it isn’t called the Flanagan-Moore Matrix. Do you have a helpful tool for prioritization? Me, I'm sticking with the NCW planner as well. So far, it's been a great addition to my writing repertoire. I'm just hoping to fill the submission pages at the back with positive notes and acceptances! Dean, I hope to fill mine with some acceptances as well. 2012 will be the year I get an article in Writers Digest! Me, too! I found the planner indispensable during NaNoWriMo, so I'm going to expand the color-coded system I used -- already bought a package of different colored Sharpies. Although I have a master To Do List with flexible deadline items, I also do priority lists for Mon/Tues, Wed/Thurs, and Fri/Sat/Sun -- the goal is not to carry over any of these tasks from list to list. If I finish a list early, I get to pick something off the master list or add to my allocated writing time. So far, it's working. Yay! THANK YOU for this post! 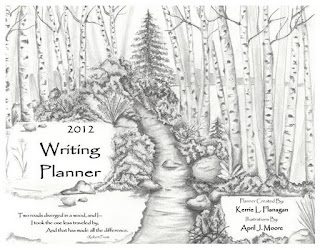 I am off to get that writing planner right NOW! It's so beautiful, and exactly what I need. It will be especially useful because I have set myself a challenge to write 12 picture books for 2012 - one per month. I invited to join others along and it's become the 12x12 in 2012 challenge. If any of your blog readers are picture book writers, stop by my blog, check it out and join us if you'd like.